It’s a powerful week to start off the month! In this year of purification, we continue with to burn the old and start anew, as if we are ‘getting it’ for the first time this week. Now is the time to let go in order to enable more freedom to enter your life. What situations, perspectives or feelings are you holding onto that weigh you down? Now is the time to let go and replace them with thoughts of inspiration, allowing the energy of love to flow through you. Take time this week to assess and review what you’ve learned so far, and where you want to go. First steps with an emphasis on new perspective and inspiration are highlighted this week. If you do the inner work, the outer work will easily follow. It’s a great week to get clear on the intentions you wish to set, with a focus on small steps. You don’t have to have it all figured out right now; all you need is the knowledge that it’s time to bring in the joy, and the rest will follow. We can use August to our full advantage if make the choice! The month looks busy in terms of making plans, healing issues, and creating commitment to our personal growth. A lot can be revealed to you if you commit to clarifying your intentions. We may wish to take lots of action this month, and we are guided to do so only if we have crystal clear intentions about our actions. The veil is thin and we are manifesting rapidly. If you take ’empty action’, the result will end up being empty also. Therefore, taking a time-out is essential this month so we can be in tune with our highest good as much as possible. Let your aim be to create joy, and don’t let the pressure of others force you into something you are not ready for; it is okay to go at your own pace and take the time you need. By September, we’ll be experiencing better balance, healing, and increased ideas of steps forward. Now more than ever I sense we are ending a cycle that began for us in 2012, which has been emphatic in revealing truths, uncovering layers and reaching a higher consciousness. We have had to let go and release over and over, get in touch with our highest truths while balancing our egos, and work on being authentic in thought and action. 2016 is a fire year, meaning it has been about purification, and every person has experienced this energy differently and uniquely. We still may be experiencing cleansing, healing and releasing the rest of the year; as August approaches, however, I am sensing a shift in energy to prepare us for 2017, which is about new beginnings. It is like preparing soil before you plant seeds, and this month we will think about what types of seeds we wish to plant as we continue to nourish the soil in which to plant them. 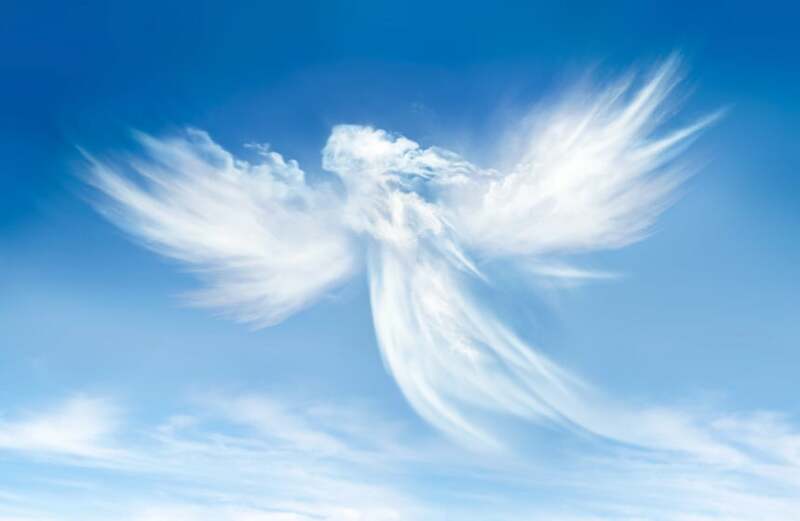 Archangel Barachiel comes through this month, who is the archangel of blessings. (He was completely unheard of by me, and I was delighted to get to know him for the first time.) What a character! He is bright, funny, and full of sass. When I channel, I invite the energy-being into my personal space and aura, and I can physically sense them enter it and sit with me. Not this guy! He was by my side, behind me, above me, and zipping all around my living room. He couldn’t sit still, and was flying in playful circles, much like a dolphin in the ocean. He gave me lots of yellow and orange energy, full of inner power, joy and creativity. Barachiel is also the chief of the guardian angels, and you can ask him for blessings and assistance through your own guardian angels. Invite him into your life to uplift you, bring you towards a successful path, and also to tickle your funny bone. (I could feel that he loves jokes and humor!) He doesn’t just help bring blessings into your life, but also helps you recognize your current blessings, amplifying your vibrational state and helping you attract joyful circumstances. I feel this month we can look forward to more energy and connecting with others. All types of relationships can be wonderfully nurtured this month, and we can take action based off of what we have learned so far. Confidence issues will be addressed, as we are guided to stop criticizing ourselves and focus instead of the inspiration behind our creative thoughts. Lots of people are wanting to take action right now, and are already doing so with various results. 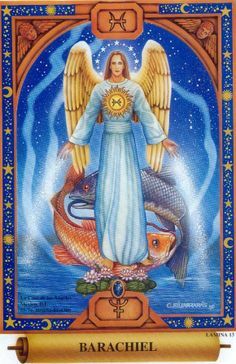 This month’s energy is going to help us with this desire to make things happen, and Barachiel mostly talks about how to bring about the most positive action possible with clear intentions. There is no sense getting in the driver’s seat if you don’t know where you want to go. It might seem simple, but I have a feeling many of us need to take the time to really figure out what we want to grow before we pick out the seeds to plant. Thank you, thank you, I am so happy to be here with you today. I am Archangel Barakiel, archangel of gifts, and I am strength and focus. You can feel my enormous energy, as I fill people up with confidence. I help you uncover barriers that were once unseen to you, and give you guidance to lift them away. You are now at a point where you are ready for action. You are like cats, poised and ready to pounce, but waiting for that perfect moment to do so. You may find that you’ve achieved goals that you set out to manifest, but you still feel empty, as if waiting for something else to appear. Each time you achieve, you immediately enter a feeling of waiting, as if you have not yet achieved the biggest thought yet, and so you constantly move towards feelings of waiting for something, bigger, more momentous, more brilliant to occur. In short, you create magnificently, and are disappointed after that journey is done. This is part of how you process your human experience. You will find yourselves ready to take action, but the struggle will be to not work backwards. You see, you must first have a thought. These thoughts must become a word, and then that word must become an action. Thoughts and Ideas to Words and Affirmations to Actions. When you try to take action before the words, and before the thoughts, that action has no creative energy behind it. That is why you must clarify your thoughts, and clarify them more by saying them out loud or in written form before you can take steps. So much has risen to the surface, and so much attention is being given to pain and fear. You may give this your attention if you so choose, and as a result you will be surrounding yourself with pain and fear. If you choose to change your thoughts, however, you can transform your life to that which is more aligned with your true nature, to be loving. We are not asking you to ignore fearful thoughts, but rather notice them, and then shift your thoughts to higher vibration thoughts. In that sense you can change and create your reality. There is always a higher thought to reach for. That is why I am here, to provide you with strength and inspiration to do so! I digress now, but I want you to know that your focus is your key to your development as a high vibrational being. Your souls and your bodies are ready to do do do, and as you are here to experience all that you can, this makes sense for you to desire the experiential process. I am telling you, that you can change your way of experiencing starting now. This is by focusing on your highest thought, and taking action based on this thought. What is the highest thought you can think, and this is a phrase you are hearing over and over again in various ways. It is in your thoughts, your music, your media, and ‘randomly’ with people in conversations. In some form or another, you are being guided to think your highest thought about yourself. Pay attention to this guidance, and focus on your mental and emotional clarity. Many things are ending and new things are beginning, and this is for a purpose. The purpose is to bring you to a higher vibrational reality. Many are succumbing to a lower vibration, as they are thinking the worst. This is okay, do not worry about them. All you need to know, as you can see from those who are lowering their thoughts, is that their reality has become a reflection of those thoughts, and they are drawing others to them who reinforce these thoughts. You can do the same, and you ARE doing the same. You will want to bring your mental focus to your highest priority. Commit to high vibration. Take action based on your highest most loving thoughts. Say words based on your most joyful ideas. Again thoughts to ideas to words to action. This is a month for you to finish healing from the issues that have been stuck in your energy field. You are releasing them so you may clear your energy, your mind, your auric body, and make room to bring in high vibrational thoughts. Say these thoughts, write them down, sing them to yourself; once they are crystal clear, take action. Thoughtful action means better creation. You will feel more powerful and more ready to create than ever before once you do this. You deserve the time and energy and focus to devote to this clarity that you need. Make space and room for it. Call upon me for the strength, for clearing away the negativity, and to bring you the inspiration. Happy last week of July! (Holy cow, already?) This week we are asked to open our heart chakras wider and take more steps towards freedom. A message came through about disengaging from judgment, which will help emotionally detach us and gives us more freedom to thrive. The week starts off with the energy of new love: you may find a new person, rekindle an existing relationship, or experience new ideas and opportunities that excite you. It is also a healing energy that reinvigorates you. We can start this week off by paying attention to our intuition and by giving our attention to loving situations that empower us. The middle of the week is full of fire and rebirth, even though it may feel like a waiting period. We are asked to give up control and focus on self-care. Don’t be deterred by the challenges which may appear in the form of situations you cannot control; this is merely trying to steer you in a better direction. The weekend is a time for endings and new beginnings, which is perfect as we begin a new month! Emotional healing comes up, especially in the forms of past experiences. Let these memories rise to the surface to be healed, so you can be lighter as you are steered in a better direction. Card Decks: The Crystal Tarot, and the Soul’s Journey Oracle Cards. This week you are invited to be the master of your own emotions. As an individual, you have the chance to take charge of your mental, emotional, physical and spiritual health this week. Stay objective, and keep fear-based energies at arm’s length, while allowing loving energy and opportunities to sift through. This week we are urged to be HEART-HEALTH CENTERED: what do you wish to allow in your life that will make you feel calm, centered, and joyful? The middle of the week we could be susceptible to falling mentally into the ‘details’ and stifle our manifestation, but you can work through it by keeping yourself mentally clear. The weekend gives us the chance to bring harmony and unity into our lives both as individuals and globally. The best thing you can do this week? Focus on what makes you feel good, balanced and vibrant! This week you continue to walk through your emotions as you continue to transform. This is a good thing: we need to go through any fears and attachments before we can step into a higher vibration of love! If you’re feeling stuck in the beginning of the week, connect with and take time for yourself. You might feel as if you have no direction, and move into feelings of helplessness in the middle of the week. You can process these feelings faster and detox by shaking up your routine. Discover rebirth within yourself by making small or big changes in your life. Your angels are here to help you feel powerful; pay attention to the signs and messages they give you! The weekend shows completion of this emotional journey as we finish the first half of July. The next half will be much brighter with lots of inspiration once you have finished working through any fear-based illusions this week and return to your heart center. This week you are encouraged to bring balance back into your life. The beginning of the week shows prosperity both emotionally and physically. You are finding your inner strength and a sense of renewal. The middle of the week is about rebirth and balance; rebirth can be painful, but it also brings a new sense of well being and creation. As you rebirth emotionally, your strength returns. The weekend brings an upswing in confidence and energy. Your feet are planted firmly on the ground, and your spirits are high, ready to tackle anything that comes your way! This month can be a month of transformation if you desire to transform. You have the chance to change your perspective and yourself, even though it could be challenging. However, this month is about healing, and finding your inner strength once again to motivate you. You can make priorities now based on what is most important to you. You might be surprised by helpful circumstances and unexpected love and connections from others. The best thing you can do is start exploring. Start new projects with enthusiasm, and follow your inner nudges to investigate new ideas. The end of the month brings mental release and rest, with a chance to take a step back and recharge. I’m really excited to bring you spiritual insights into the month of July, with a dialogue between myself and one of my guardian angels Dominic. I wanted to post this by July 1st, but the dialogue has been continuing for several days, so I decided to wait until we had finished our conversation! Typically I try to tune into an ascended master or archangel for each month’s channeling, but this time it felt like Dominic had a lot to share that would feel relevant to many of us. The first time I saw Dominic, he looked like he was in a 90’s grunge rock band–a red flannel shirt, black pants, and long, black, disheveled hair. We’ve grown quite close the past several years in particular, and I can always feel him on my left side. When I am feeling drained or upset, I can feel his hand holding mine as he brings me the energy of comfort and peace. He’s very straightforward and speaks his own truth. 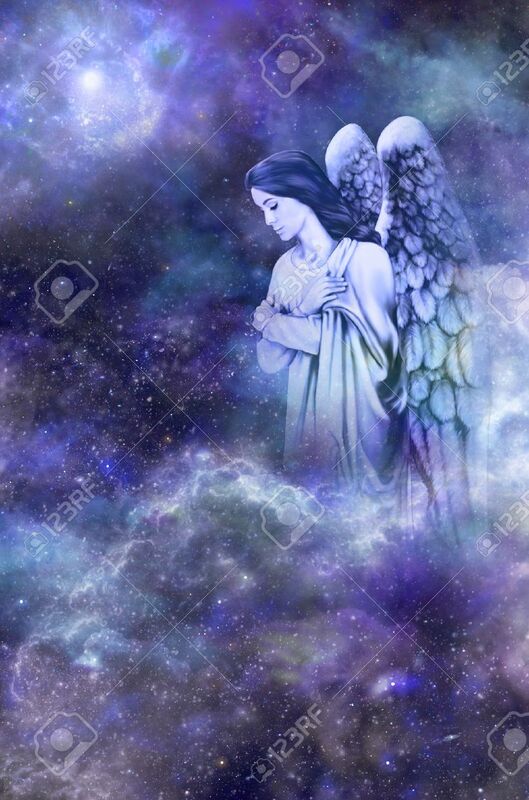 We all have guardian angels who are accessible to us always. If you don’t know yours, start talking and thinking to them; tell them about your day, your hopes and dreams, sing with them while driving, and invite them to be in your presence. Their energy is warm, protective and loving, and they have much to share with you. Me: What would you like us to know about the month of July? Dominic: You might feel this ‘basic’, but there are really two big paths you can take this month: fall into fear, or transform it all with love. It’s the simplest of lessons, and yet the most difficult for you to achieve on this plane. Me: Can you explain more? Dominic: This month is about transformation, but you first have to transition out of the thought of ‘selective transformation.’ When something transforms, every bit of it does. This is true transformation: every single part of a anything with life force will transform. When earth beings try to transform, it is more difficult, because they only want certain parts to transform and develop. Transformation is holistic, and encompasses every part of you. You must be willing to let everything about you transform and ascend. One of the reasons this is difficult for you is you are afraid of losing something in the process. Your identities are very important to you, and since you base much of your identity on the physical, which is always temporary, it is hard for you to shift your consciousness to spiritual thinking. You lose things in the physical, but you do not lose in the spiritual. You can start to shift your thinking and your perspective about your physical identity, that these physical aspects are merely reflections of what you are spiritually remembering. Some are reflections of what you need to spiritually heal, what your spiritual strengths are…every physical aspect about you has a deeper meaning that relates to your soul. Me: So, if we are to transform, we must do so with a ‘I surrender myself’ type of thinking? Dominic: Yes and no. You are creators, after all, and contrary to your belief, to create doesn’t mean to also control. Creation is an act of love; control is an act of fear. If you wish to create, you must give up the programmed desire to control. If you wish to transform, you must do so willingly without fear. Surrendering is just your way of identifying how to do something with trust and without fear. Surrendering is your way of spiritually trusting yourself. You are all desiring deeply to ascend, and with this desire comes conflict from your ego. Me: There’s so much tragedy going on, lots of violence and acts of fear, and people seem like they feel so stuck. Dominic: You can think of it is tragic, but know that we do not judge any acts. People are experiencing the physical, and you are the ones labeling the good and the bad. Some of these acts are coming out of resistance of their spirit; some are out of fear. If you feel the call to do something, then do it, as long as you feel it presents you the way you wish to be presented. Feeling stuck, however, is a natural part of the process of ascension. Me: How is being stuck a part of it? Dominic: Feeling stuck, yet know you are not, because the wheel is always turning. It is like changing the channel on a television: you are enjoying a program for awhile, but then you become bored and want to tune into something else. However, you don’t know what that something else is yet. So, you change the channel, and come to the ‘in-between’ channels that show static, or uninteresting programs. Feeling stuck is like this process. Until you tune into a program that speaks to you the most at that moment in time, you will continue tuning into static. This is simply you moving and seeking until you find your next step in your ascension. Me: So, how can we speed up the process this month so we can tune into the best program possible for ourselves? Dominic: Be willing to transform. You will never find something to properly suit your spiritual needs and growth if you are unwilling to truly move on and let go. Transforming requires you release, because transformation is about liberation. This requires you to visit and revisit all your present circumstances, to be aware of your perspective and how you function, and to liberate yourself of all in the present moment. I do not mean take your possessions and throw them away, unless you feel called to do so. I mean to not let your circumstances and material life be the driving force, which is usually what has motivated humans in the past. This is no longer working for you; you have moved beyond that. Your driving force is love and creation. Let your thinking transform in this way. You do not buy food because your stomach is empty and you wish to fill it; you buy food to nourish yourself as an act of love for yourself. This way you shift your focus from lack to love, from physical needs to expressions of love. We tell you often you will not find fulfillment in the outside forces of your life, but that it has to come from within. Take that deeper this month, because the ‘within’ is YOU; outside forces CAN affect and nourish you, but only when you are the force behind it. When they come from your desire, your creation, and your love. It is always fulfilling when you are the manifesting one, rather than waiting for others to fulfill your needs and desires. Be willing to listen, go within, and ‘shop around’ this month. You will have lots of desires and impulses, feelings of stagnation and despair, but simply accept these periods and acknowledge that the wheel within you is always turning and always ascending. Start connecting with others, doing things outside your comfort zone (many of you really do need that push), because nothing will transform for you if you are unwilling to transform yourself. Remember, remember, that you are pure love and perfect, and this month is helping you to remember that.